My "words" that I want to live out with passion this year are faith and hope. Faith includes believing that the Lord will provide in all circumstances exactly what is needed without fail. Hope is the joy that comes from faith, the belief in something more, the intangible that you hold on to when all seems lost. Faith and Hope are meant to be shared, and so I would like to introduce to you two very special little girls that are now my very special little girls. Meet sweet Miangeda! 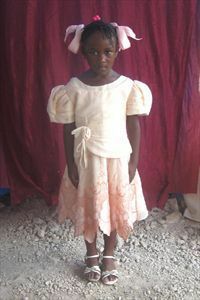 She is six years old and lives in the mountains of Haiti. She was chosen to be ours by my mother and I as she just captured our hearts. She looks so solemn for such a little thing. I have not yet received the full sponsorship packet for her, but I do know that she loves reading and playing with dolls, and is doing above average in school. Please add this little one to your prayers! I would like to introduce precious Monique! She is nine, going to be ten in August (her birthday is only 5 days after mine!) 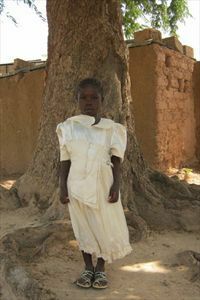 and lives on the flatlands of Burkina Faso, one of the poorest countries in Africa. I fell in love with her and can not wait until the day I receive a picture of this sweetheart smiling! I do not have her full sponsorship packet either but I do know that she has few if any toys and instead enjoys playing with boxes. Boxes, it just breaks my heart. She too is doing above average in school despite all obstacles. Please add her to your prayers!! This is the Bethelehem Child Survival Program in Bory. Haiti. 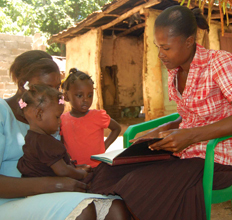 Haiti's maternal mortality rate is 630 per 100,000 while the infant mortality rate is 86 per 1,000. The Child Survival Program provides monthly health screenings for pregnant mothers, a monthly food kit of healthy nourishing food, immunizations and health screenings for infants and young children, education, parental skills training, and job skills training. Please pray for the mothers and children who receive care here. Yes, I live on a very limited budget. Yes, I could use the money elsewhere. But elsewhere is not where I am called to use it and elsewhere is not going to make a difference in the lives of two beautiful, precious little princesses who already look so weary. Elsewhere is not going to provide immunizations to babies, elsewhere is not going to feed pregnant mothers, elsewhere is not going to educate a community of young mothers on how to meet the needs of their child - simple things like hygeine and avoiding infections to how to read a book together. Elsewhere and Some other time are always going to be there. These children are here, now and they can't wait. I believe that living with passion means giving until it causes sacrifice. I can not change the world, but for now I can change a few lives. God will provide the rest. And I get to share with these little ones the fact that they are in fact true princesses of the Lord, real princesses and instead of being forgotten they were chosen and so loved!! It all comes down to faith and hope! Darlin... what sweet girls Do you know if I could sew for them? Are you allowed to send them things? It would be a simple joy to make them some pretty dresses-- or hair bows.-- Something to let them feel pretty and special. Let me know... :) I'll be your worker bee! Compassion International has very strict guidelines as to what can and can not be sent to a sponsored child. All items must be made of paper or similar products, be no larger than 8 1/2"x11", and be no more than 1/4" thick. I have had to be creative but have gathered together an assortment of goodies to send to the girls ranging from art projects they can do to a ton of stickers to coloring pages to small booklets of mazes and such. My incredibly artistic (went to art school) best friend is making them paper dolls. Well darn... paper things are not very easy for me... but I'll ask people I know that are good with paper... maybe they can help me give and be crafty!